From the pubs of London to the ruins of Athens, these are the European destinations Americans are wishing for this summer. Ever wondered which European destinations are the most popular for American travelers to visit? The Hopper team aggregated a huge number of flight searches to discover which airports in Europe were searched for the most from U.S. destinations. First on our list: Amsterdam, the beautiful Dutch city where canals thread through narrow streets and bicycles speed over picturesque bridges. Flights to this arts-and-culture-filled city average about $973, but a good way to save money is to fly into a cheaper European airport and take one of many quick train trips right to Amsterdam! That way, you can save a bit for your trip to the Rijksmuseum, the Van Gogh Museum, and the Artis Zoo. Americans can travel to Athens for about $959 on average. It's not the cheapest but its historic sites, charming outdoor cafes and expansive hillsides surrounding the city keep visitors coming year after year. They tour the Acropolis, where the historic Parthenon sits atop one of these surrounding hills. Views of the Saronic Gulf, where Athens meets the Aegean Sea, can be seen from this high city as well as the historic architecture that makes Athens so memorable. Flights to Milan, Italy, average about $781, making it the cheapest European destination on this list for U.S. visitors. This global city is particularly popular in the fashion world, made famous by Italian fashion brands such as Valentino, Gucci, Versace, Prada, Armani and Dolce & Gabbana. But luxury shopping isn't the only draw in this fashion-forward city. Milan is also known for industrial design and architecture, featuring modern skyscrapers like the Pirelli Tower. We found more than 1.5 million monthly searches for flights to Frankfurt, Germany, making it the seventh most popular destination in Europe. Frankfurt is the largest financial center in continental Europe and is home to the European Central Bank, Deutsche Bundesbank, Frankfurt Stock Exchange Flights and several commercial banks. For this, it is known as a global city and has one of the world's busiest international airports by passenger traffic. Flights to this cultural German destination average about $1,010. 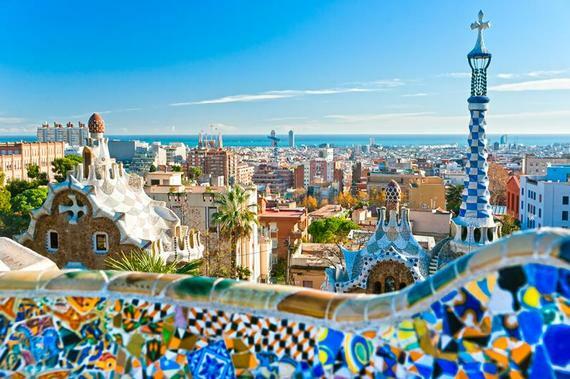 Flights to Barcelona, Spain cost about $977, and we uncovered about 1.6 million monthly searches for them. Travelers love this Spanish destination for its funky Spanish Gothic architecture. The Gothic Quarter, for instance, makes up the center of Barcelona's old city. Several of the buildings date back to Medieval times and as far back as when Romans settled the city. Visitors can check out remains of the Roman Wall or explore the area's small streets -- most of which open out into squares. Madrid, Spain is even more appealing for American travelers to visit than Barcelona. Plus, it's about $35 cheaper to fly here. Spain's capital city, Madrid serves as the political, economic and cultural center of Spain. Art enthusiasts will want to visit the Prado Museum, which features one of the world's finest collections of European art. Less traditional art aficionados will want to head to Malasana, a neighborhood that has several bohemian cafes and galleries featuring artworks from local artists. Dublin, Ireland, the fourth most-searched European destination and second cheapest to fly to, is a tourist favorite. While it, too, has thousands of authentic pubs to grab a pint, its historic landmarks are truly impressive. Dublin Castle, for instance, currently serves as a major Irish government complex but was long the seat of British rule in Ireland until 1922. Visitors can still see the Record Tower, the last surviving tower from the medieval castle that dates back to 1228. 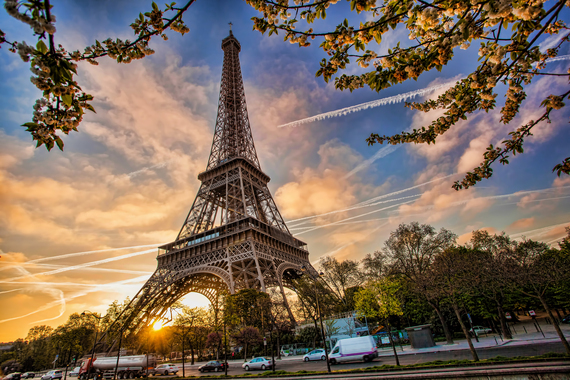 We found about 3.7 million monthly searches for flights to Paris, France, making it the second most popular European destination to visit. (No surprise there.) Travelers can choose between artsy explorations to the Louvre and Musee d'Orsay; dining on delicious cheeses, breads and fine wines at one of thousands of outdoor cafes; or simply strolling the shops in the historic Marais. While the Eiffel Tower is often swarmed with tourists, the Champ de Mars landscaped park is a fun place to peruse with beautiful views of the famous landmark. Flights to Paris average about $995. London, England, is by far the most searched for destination in Europe with 6.7 million monthly searches to both of its major airports, Heathrow and Gatwick. London Heathrow Airport is the United Kingdom's largest airport and received the most visitors. However, tickets tend to be about $60 more expensive than flying into London Gatwick Airport, so if a Gatwick arrival is available from your airport, it's worth looking into! This article originally appeared on Hopper.com, the big-data-driven site and mobile app that tracks and predicts airfare for you.